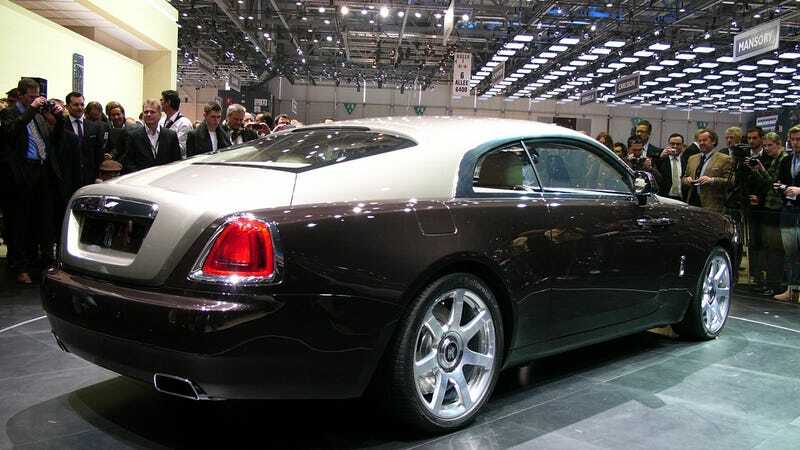 If you’ve always wanted a humongous sort-of-British fastback, Rolls-Royce has now got you covered with the 623-hp Wraith. The most powerful Rolls ever made is also the most Mustang-y. It’s always cheerful to hear “treasured and beloved British icon” in a heavy German accent, which is how Rolls–Royce was described by their CEO Torsten Müller-Ötvös, a fiercely German guy in a shiny purple tie. Rolls-Royce, which never used to publish horsepower figures, now publishes kilowatt figures: 465 from the new Wraith’s twin-turbo V12, which translates to 623 horses. This great simulacrum of Britishness also has, you would never guess, leather and wood in its yacht-like cabin. Also, a fastback. Doesn’t really work in the Teutonic two-tone paintjob it was unveiled with but black on black, or perhaps charcoal gray, would look very wraithlike and wicked.